A few weeks ago, Brandon Andersen wrote on Waxing Unlyrical about the PESO model and how to use it in content distribution. As an example, he used the goal of producing 2,000 downloads that equate to marketing soft leads for sales. This goal should be shared across the entire marketing/communications department. It’s not a content marketing goal or a PR goal. It’s a multi-department goal. And then he went on to outline how content, social, and PR should work together to reach the goal of 2,000 downloads. It’s very good and I recommend you read it, if you haven’t already. 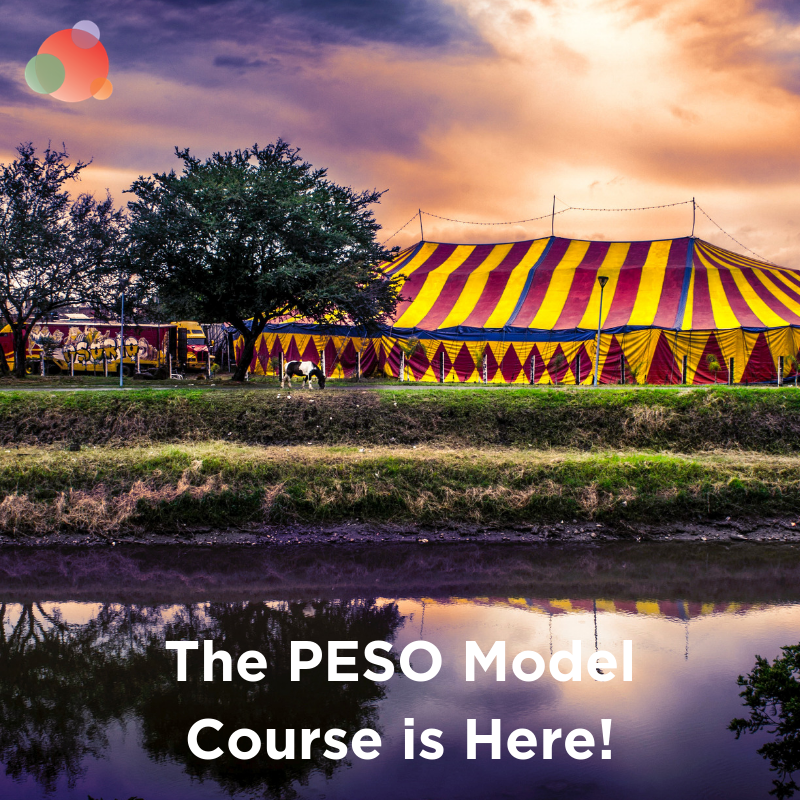 It shows how the PESO model works across departments–and the importance of working together versus in a silo. It’s the perfect case study of how the PESO model works to build authority, increase credibility, and drive real business results. It also assumes content and social don’t belong to PR, which I don’t agree with. In the least. 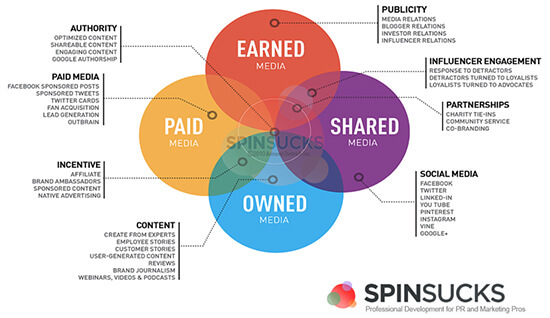 Yes, media relations (or earned media) is absolutely part of what we do—and it owns one quarter of the PESO model. But it is only one quarter. 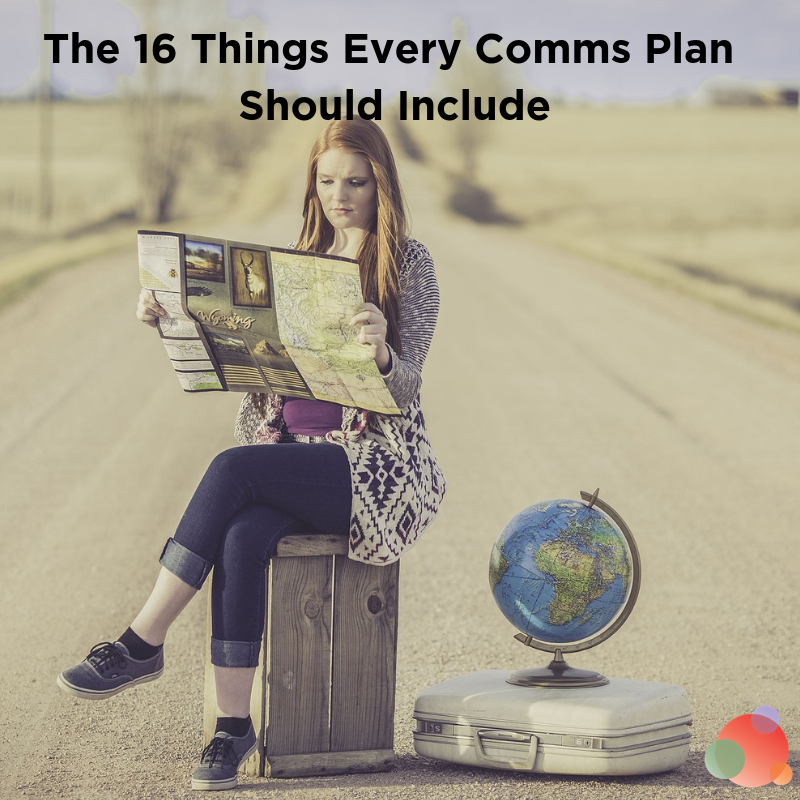 There are three other quarters in the integrated model that are just as important—and fall underneath the public relations or communications umbrella (whatever you want to call yourself). I had an interesting conversation with Garrett Moon, the co-founder of CoSchedule, last month about their Buzz and Brand team. This is their communications team, but it’s named differently because they don’t do media relations. Influencer relations, yes. Content marketing, yes. Social media, yes. But no traditional media relations, so he changed the name of the team from something PR-related to Buzz and Brand. The industry can’t get it straight, nor can a good number of PR professionals. People tend to call themselves communicators if they do more than media relations. 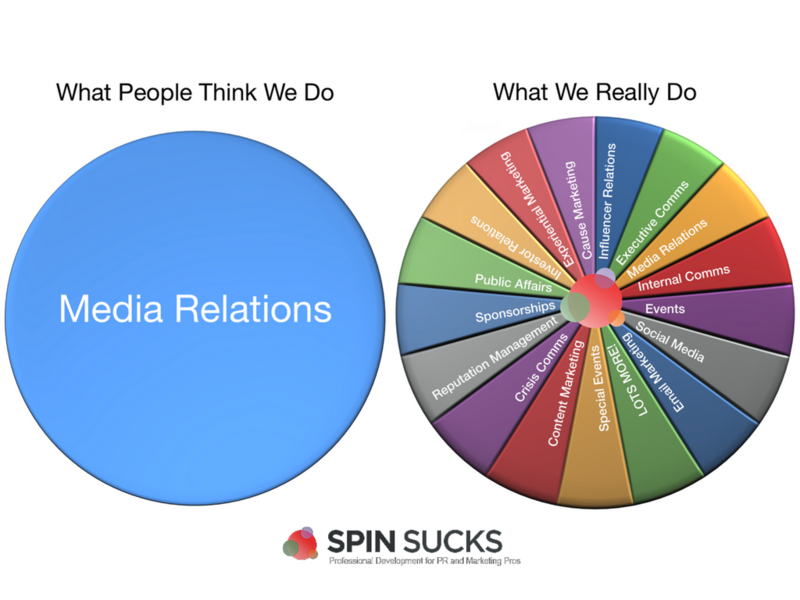 And those who do do media relations tend to call themselves PR pros. From where I sit—and where I see the industry going—it’s all the same. We’re all communicators. We’re all public relations professionals. We do content marketing and social media and paid Facebook ads and native advertising and email marketing and media relations and influencer relations and contributed content. They rely on sophisticated relationship building skills. Both of these things are what communicators (or PR pros) do naturally. It’s why we do what we do for a living. Yet today, we see SEO specialists doing earned media to earn valuable links from higher domain authority sites. And we see marketers doing influencer relations. And we see advertisers telling stories in new and interesting ways. These disciplines are slowly taking over what we should own, but don’t. We use the “blurring of the lines” excuse and say there is enough room for all of us. Which is it? Are the lines blurring so much that we all are the same, or do we want a seat at the table? Because if it’s the latter, I am here to tell you that if you sit back and say the lines are blurring and your role isn’t evolving, you won’t ever have a seat at the table. You will still need to hire or work with media experts—copywriters, data analysts, media planners, and more—but you should know enough about each media type to lead the team and get the best work you can out of them. In paid media, you understand how the Facebook pixel works and how to create custom audiences. You understand when and how native advertising should be used—and the best publications for your industry to test it. You know how email marketing affects the growth of your organization, and you’re willing to test new theories and ideas. GDPR isn’t a big, scary thing because you know how it will affect your organization, and you’ve worked to put fail safes into place. There is A/B testing and you have data to back up new ideas. In earned media, you know the best way to build relationships with journalists today. You pay attention the advice people like Michael Smart and Todd Walker are providing—and you can guide a team to best results, if you’re not doing it yourself. The team is getting results that can be attributed to their contributed content and media relations efforts. In shared media, you know how the latest changes or news will affect the work you’re doing. If Cambridge Analytica is accused of sharing data to influence an election and you spend a lot of time on Facebook, you’re prepared to have a conversation with your executives about how that might affect your work. If a lot of your work is on Snapchat and an influencer encourages people to drop the social network, you know how it will change the work you’re doing. In owned media, you ignore the best practices and the content shock uproar and move forward with sophisticated content because you know it’s better than anyone else out there. You use predictive analysis and content intelligence to inform your decisions. Your immediate team and your executive team trust your recommendations because you know how to get results. Then you bring it all together with results. While you may have a data analyst or two helping you out—or you use attribution software, such as TrendKite or AirPR—you know how to use that information to sell your results to the executive team. Whatever you call it, the PESO model belongs to us. It’s time we step up and take a leadership position.